In 2010, I found myself having a very different Christmas Eve than I’m used to. For one thing, I’m in Africa, in a hot climate – no White Christmas for this Chitalian this year!! Unless you count the fact that I wore a white shirt and towel walking around Moucha Island or the white sand beach we were on – that was as white as this Christmas would get! But if I have to “settle” for white sand instead of a blanket of snow on the ground, I guess I’ll survive! 🙂 About 10 of us got onto the boat Christmas Eve morning around 8am, and the boat raced off towards Moucha Island, located in the Gulf of Tadjoura in Djibouti. 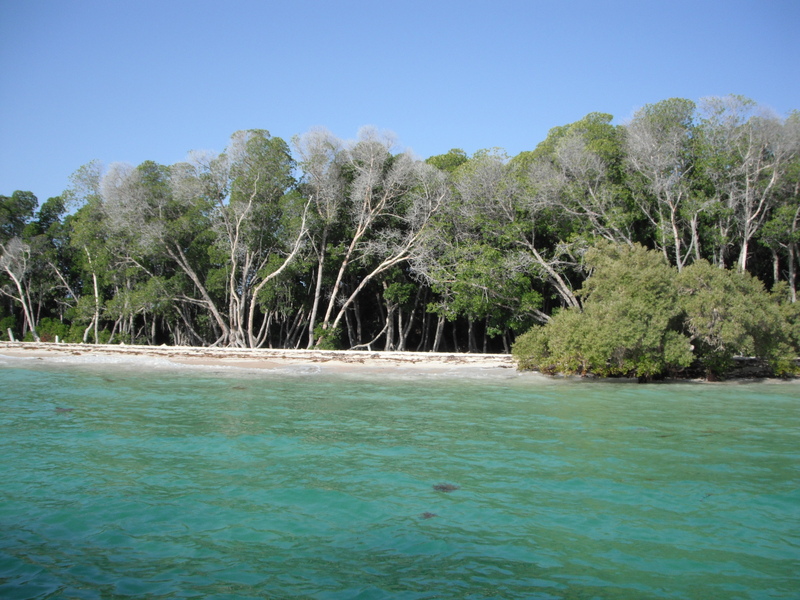 Around 30-45 minutes later, we were arriving at this beautiful coral island, with the white sands spread out before us. There is a hotel on this island, and a few private houses, but much of the island is preserved, so it can’t be developed. Our boat pulled in to a nice, quiet area – around on the other side of the island from the hotel property. 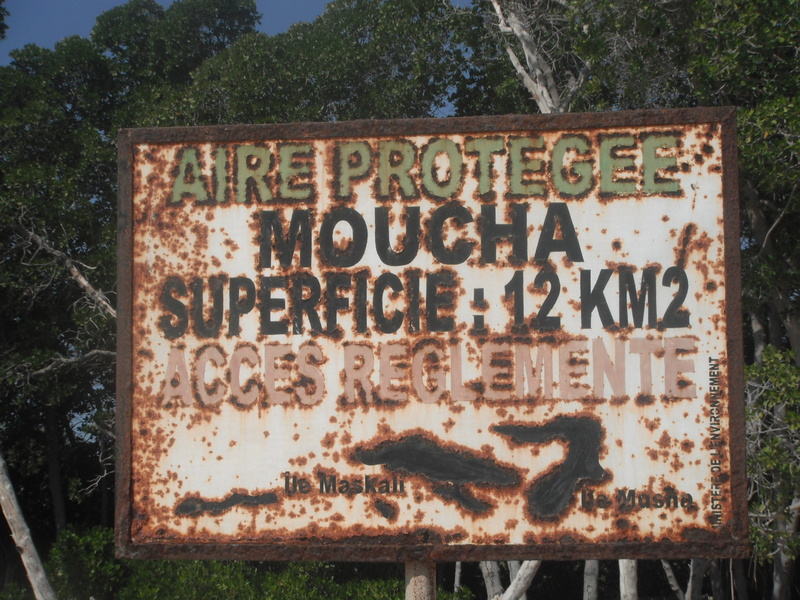 Moucha is only 12km big, so it’s not very large, so we came out early to get our pick of spots. We found ourselves a nice, shaded area to spread out our tarp and as soon as we had unloaded our stuff, a few of us got right back onto the boat to head out a ways into the water to do some snorkeling. I had, once again, borrowed some snorkel gear from someone else (I really should invest in my own set soon!) and jumped into the water to see what there was to see! The reef that we visited was not as nice as the one that we went to after the whale shark trips, as it’s not as colorful, and seems to have less species of fish. Maybe that’s because the other reef is sort of in a bigger bay and is more protected, and this one was more in the open water? Not really being a diver, I am really not sure about these things, though perhaps one of my diver friends can educate me on this subject or comment on it here. And the water was a little less clear than the other reef….. 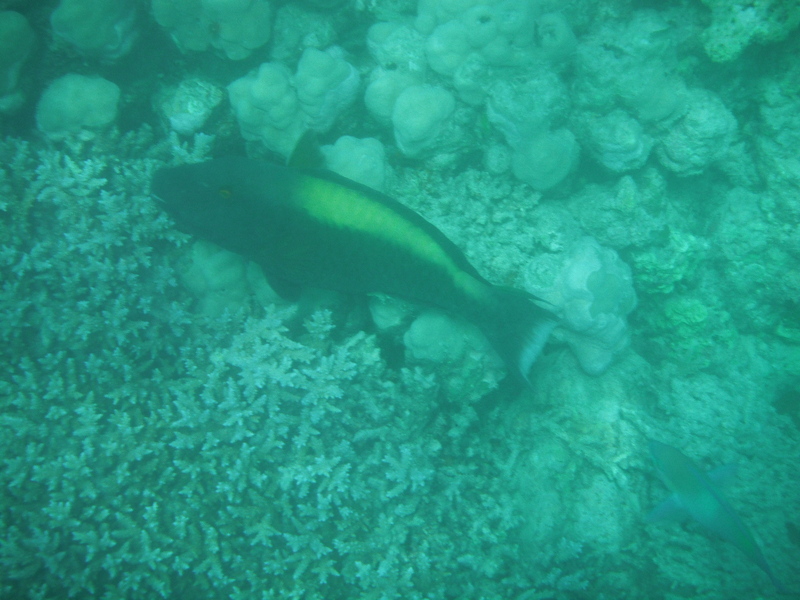 I think I’ve been spoiled by my other recent snorkeling adventures though, because it was still beautiful! Or maybe I was just frustrated, as my borrowed mask kept letting in salt water and fogging up. Definitely time to find some well-fitting gear of my own. I threw in the towel and returned to the boat to wait for the rest of the group to finish their exploring, and lounged in the sun a little bit. I was a little self-conscious because I was one of only two women on this trip, the men were mostly (or all, I’m not sure, as many did not speak any common language with me, communicating mostly in Arabic) Muslim, and the other woman was Muslim. 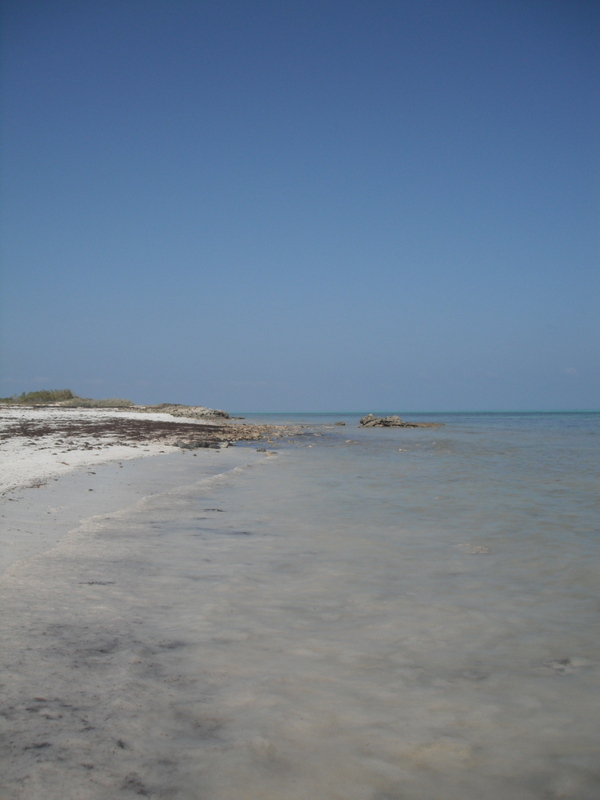 She snorkeled wearing pants, a long-sleeved shirt, and a head scarf, and there I was in my tankini – not the most risqué swimwear, but still more revealing than a long-sleeved-shirt and pants! But also more comfortable when wet, so I was OK with the trade-off. I just covered up with a towel, shirt or pants for most of the day. I don’t think anyone was bothered or offended by my choice of swimwear, as I’m not a Muslim woman and so generally not expected to adhere to the same standards, but still I felt like a little more modesty was probably the best choice. 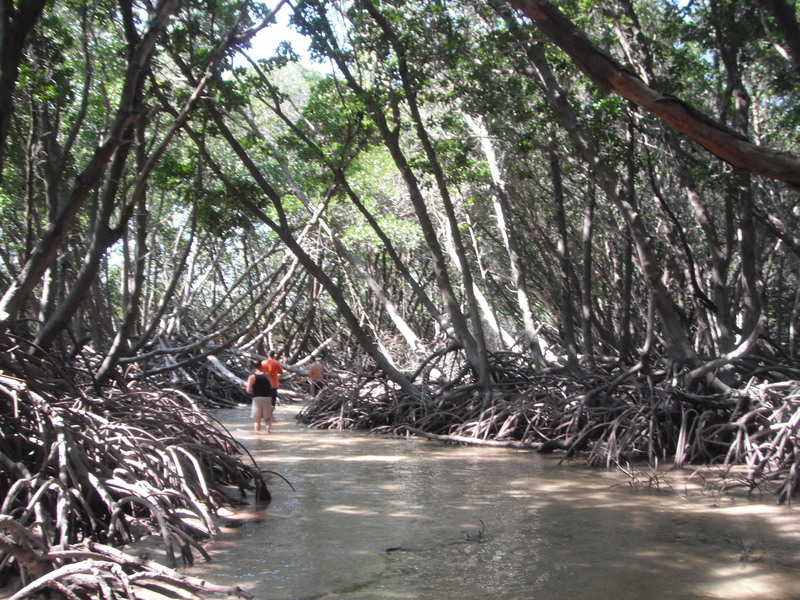 Right off of the beach at Moucha Island are these trees, that seem to grow out of a sort of stream that goes throughout the island, and apparently straight through almost to the other side. 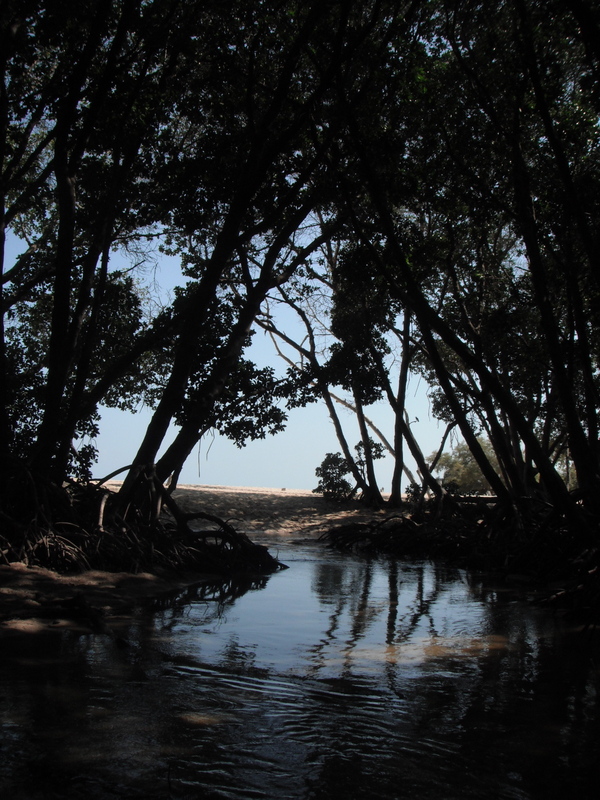 After a lovely picnic, we decided to explore, and walk through the shallow waters to see where they led us. 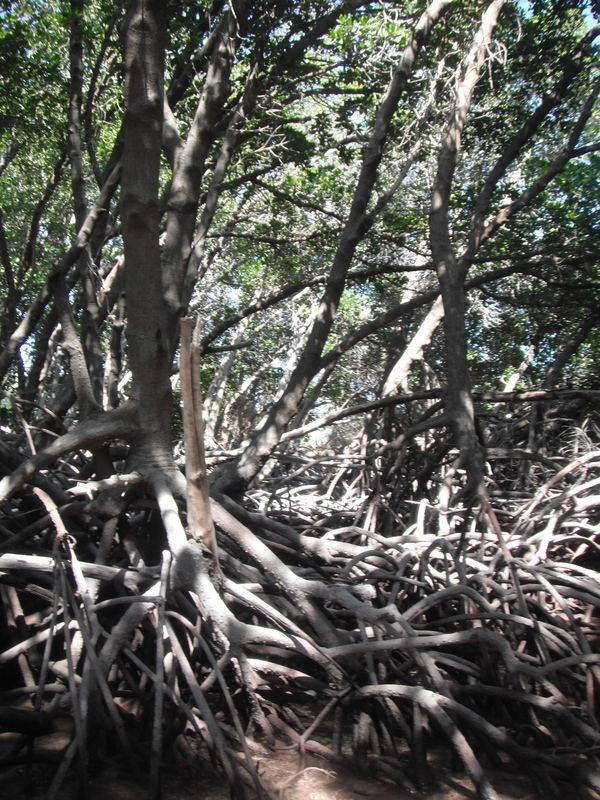 Our walk had us clamoring over or under fallen trees, root systems, and branches, but the water was shallow and warm, and it really was a lovely walk. The sand was soft beneath our feet, and despite finding myself in deeper pools every once in a while, it wasn’t hard to find solid footing on the bed of the stream. 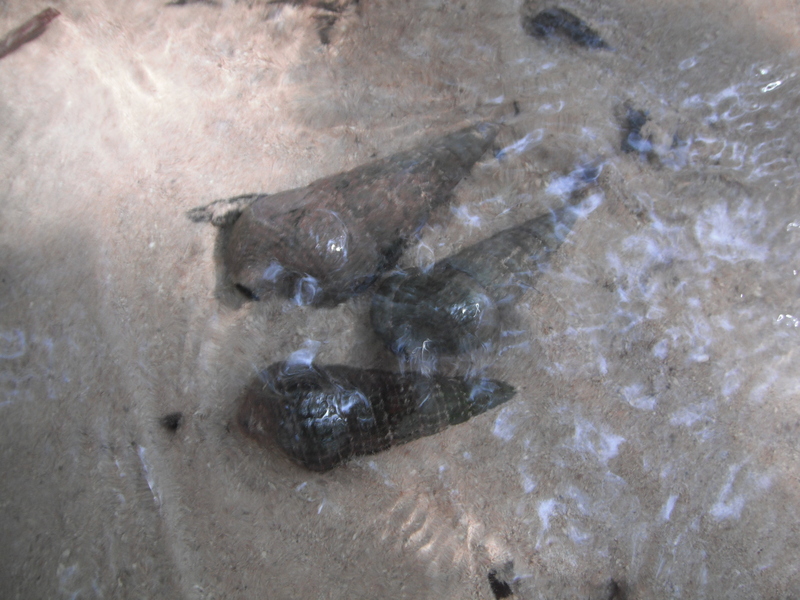 Though you did have to watch out not to step on the pointy-tipped shells of the many crabs living in the water! 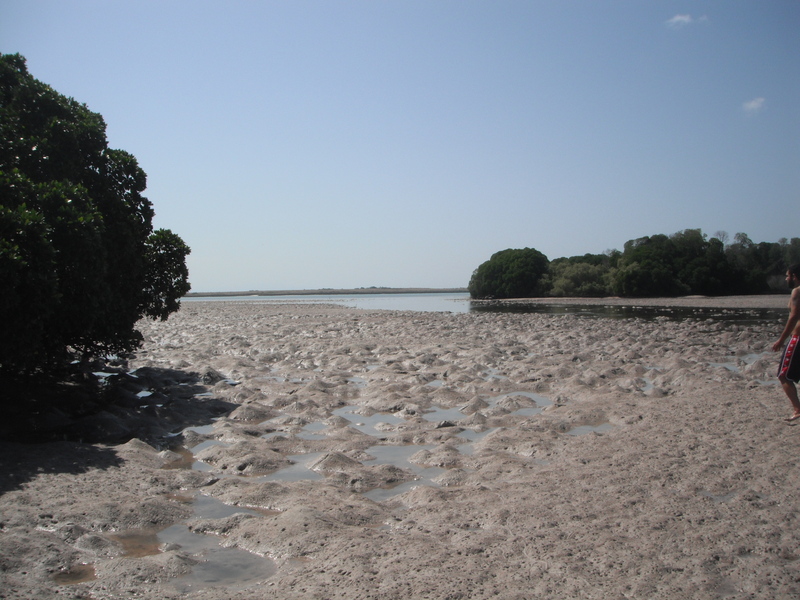 After following the stream a little ways, we came to a big open area, where clearly the water level had only recently dropped, as the tide was out at this time. There were tons of piles of sand, with holes in them, presumably where more crabs were living. We saw a couple of them swimming in the shallow waters or scampering about across the sand. Mostly they were about the size and looked similar to what I’ve had served as “soft-shelled crab” in the US, nothing like Alaskan King Crab size, or Snow Crab size. They were kind of cute scampering about, though I really tried to avoid getting too close for fear of getting pinched! This really was a beautiful place, untouched and undeveloped with no signs of the modern world. Just how I like it! The sandy/muddy ground beneath our feet squished up between our toes, exfoliating our feet and giving us a very natural pedicure. The soft earth gave the impression of being just the right texture for a mud mask, but I wasn’t ready to slather myself in it, just to see what it would do for my skin. I settled for having well-exfoliated, softly smoothed feet, and left it at that, while enjoying the beautiful surroundings. I’ll have a chance soon to visit the Dead and Read Seas when I visit Jordan, so perhaps I’ll leave the mud mask until then, as the Dead Sea masks are supposed to be wonderful for the skin!! 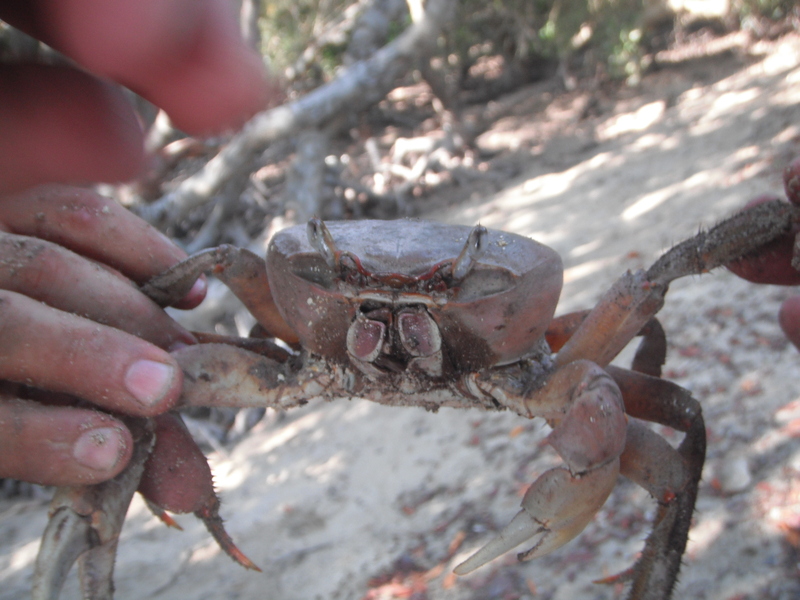 A crabby new friend.... well, acquaintance.... he didn't seem to like us too much!! You can find great free blog designs on WordPress.com. That’s where I got my blog started. You can start for free, and then if you want to pay for a premium design (I haven’t), you can. I did decide to buy my domain name instead of staying with the free one, but that isn’t too expensive either. Look into the free ones first, and then decide what upgrades you want or need after you have started. I say start simple, and build from there. Good luck!!! I hope you enjoy it as much as I do.